« Never Too Late? Estudiando Español en Mexico! “Dredgefest” appeared out of the blue in an email a couple of months ago, a title I couldn’t resist. I taught a class at the SF Art Institute a couple of years ago called “Dredge” so I didn’t think twice before signing up for their Saturday June 18 bus tour of bay shoreline sites. I was not disappointed! The tour visited three locations, Hamilton Field in Marin County, Sears Point National Wildlife Refuge on the northern shore of San Pablo Bay due south of the intersection of Highway 37 and the Lakeville Highway, and finally the Cullinan Ranch restoration project just west of Mare Island near Vallejo. 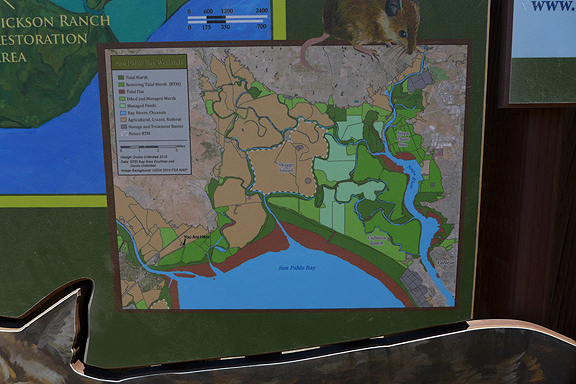 Each site is former military and agricultural land being returned to marshland, with differing levels of deliberate design and engineering interventions. 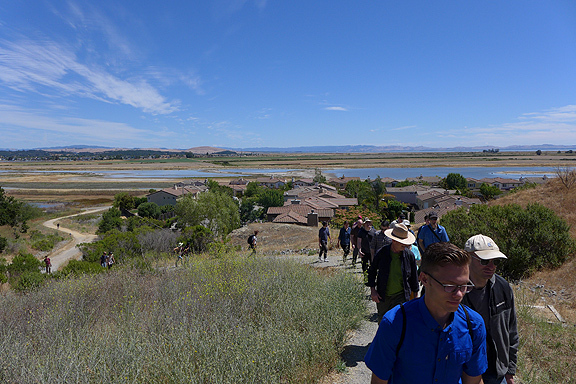 A full bus load of mud lovers, bird watchers, landscape engineers, hydrologists, citizen scientists, and radical librarians climbing a low ridge above Hamilton Field, once an airforce base with below sea level runways, now a showcase restoration project on the Marin County bay shore. In the native plant nursery at Hamilton Field some helpful maps helped situate us. HWRP is the Hamilton Field Wetlands Restoration Project. This is the closely designed plan for the former air base. 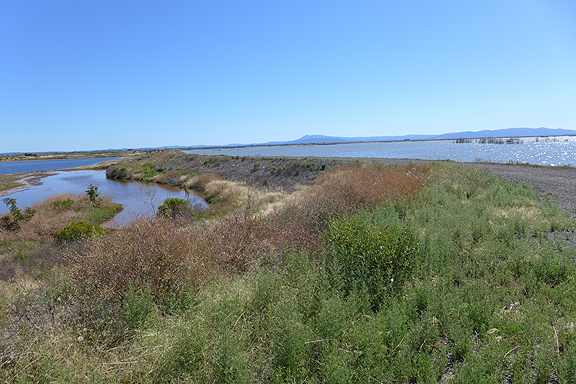 For two years, 24/7, dredge materials from excavation at the Port of Oakland was pumped through an “Aquatic Transfer Device” specifically designed for this project (with a dedicated substation to provide enough power to run two 700 horsepower pumps fulltime) into the site to help contour the lands to become tidal marshes as soon as possible after the 2014 dike breach. Not only did the project carry out the dike breach on schedule in 2014 but apparently natural processes are in fact developing largely as planned. Against all odds, things are going very well! A variety of berms and data gathering stations help marshland dynamics re-emerge while providing the measurements to help the biologists and hydrologists figure out what went right and what didn’t. As you can see in the previous photo, the Hamilton Field restoration also includes parcels dedicated to suburban housing development. We were treated to detailed explanations of the ten-year multi-agency effort to raise the underlying lands enough to allow for successions of plant and animal life to flourish in the new/old wetlands. But the technical discussions of landscape design didn’t impress me as much as the remarkable story of bureaucratic cooperation and adaptation to overcome an endless series of budgetary, jurisdictional, political, and conceptual disputes. Unlikely coordination was achieved between the Army Corps of Engineers, the Port of Oakland, the Bay Conservation and Development Commission, the California Coastal Conservancy, the California State Water Board, the California State Lands Commission, California Fish and Wildlife, NOAA Fisheries, the Environmental Protection Agency, and more that I can’t remember. The key to the Hamilton Field project was getting the dredge materials from the Port of Oakland, where the Army Corps is responsible for maintaining channel depths, and since it was decided to lower the channel depths from 42′ to 50′ to accommodate the new massive container ships, the Port and the Corps had a huge disposal problem. The Hamilton Field restoration project is one of the first to successfully use millions of cubic yards of bay dredge material to implement plans to remake historic marshlands. Until a decade ago, many environmental groups were opposed to the concept, assuming that it was a ruse to allow industry to dump toxic dredge with a “greenwashing” cover story. But according to the participant-experts who explained the project to us, the successful remaking of flourishing habitat for endangered species has won over most if not all of the critics and muted opposition to expanded efforts on other bayshore sites. From Hamilton Field we drove north on Highway 101 to the Highway 37 turnoff, the two-lane road that traverses the north edge of the Bay but for much of it lies below sea level on the other side of levees that may or may not hold the rising seas back in the years to come. 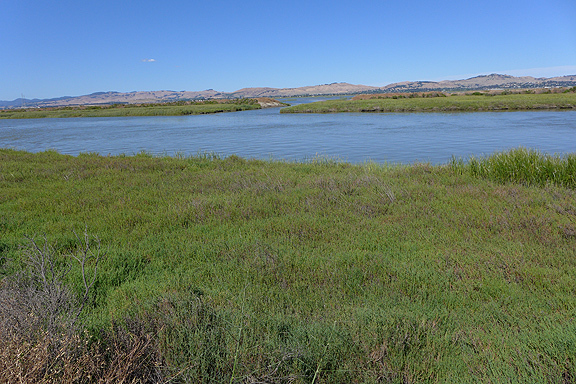 This levee is the last line of protection for the Petaluma River valley, with recently restored marshes to its left (south) and lower farmlands and a quarter mile to Highway 37 to its right (north). 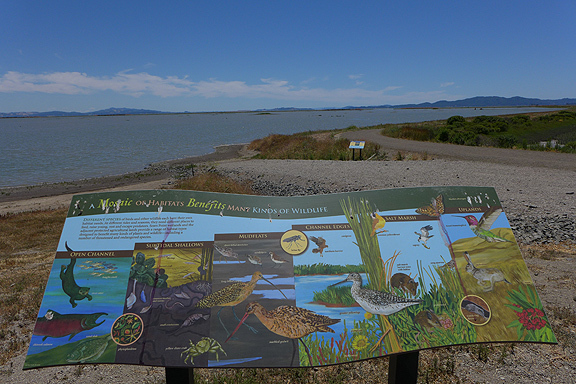 The sites we visited feature a lot of informative signage along bayshore trails. You may be able to see the San Francisco skyline on the far horizon behind the San Rafael bridge. 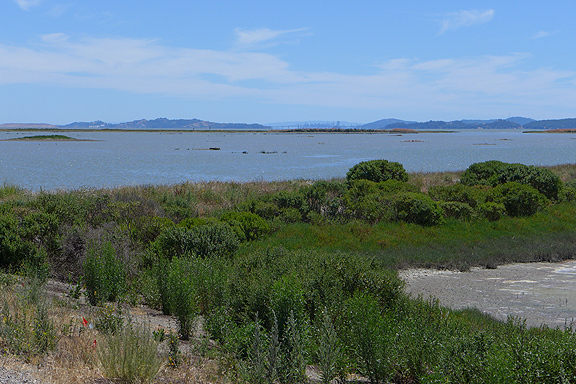 This view is from the marshlands along the north shore of San Pablo Bay. 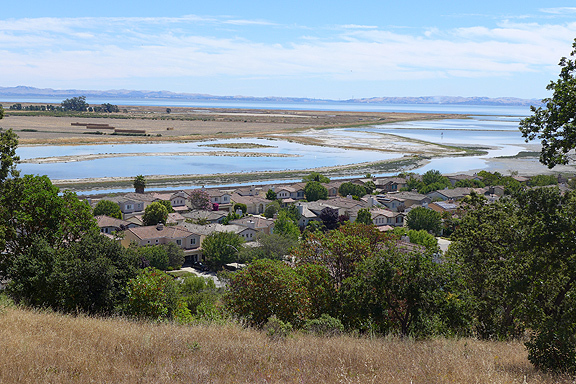 I really loved visiting the Sears Point Baylands because when I was 18-19 I used to drive by here every weekend, commuting from my college dorm at Sonoma State in Cotati to Oakland most weekends to caddy at the Claremont Country Club where I’d worked since high school. The Lakeville Highway goes due north from this spot and has some of the most magnificent and majestic century-old eucalyptus trees lining it. Cougar Mountain, east of Lakeville Highway and north of Highway 37. Over the hill is the Sears Pt. Raceway where cars go very fast. I finally got to wander around near this long off-limits shoreline zone. 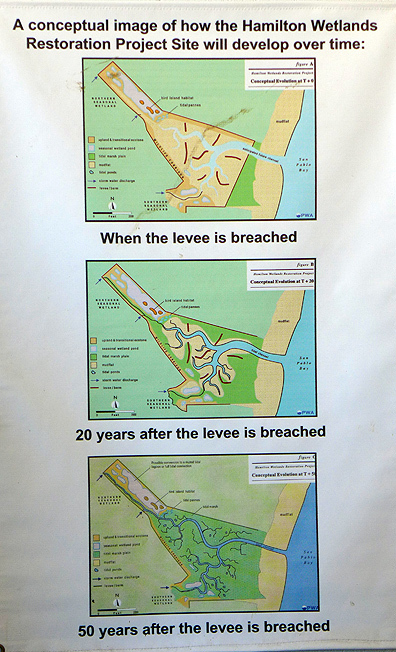 Apparently one of the marshes was breached by executive order from Vice President Al Gore in 1999 and had very little intervention from restorationists. It has proven to be a happy surprise as the marshes have come back to life much faster, and in much better health with greater diversity than anyone expected. 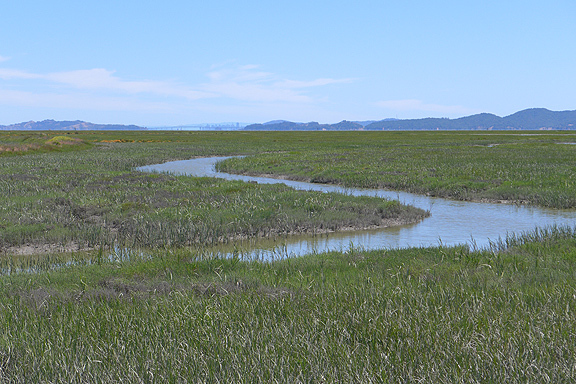 Healthy marshes with natural tidal channels at Sears Point. Helpful signs to alert uninformed visitors to the natural inhabitants of this shoreline zone. We continued eastward along Highway 37 in crazily heavy traffic, u-turning back over the bridge crossing the Napa River to drive out a temporary levee between the Cullinan Ranch parcel that is now part of the Bay after several breaches were cut to Dutchman Slough allowing bay waters to submerge the former wheat fields. An eastern parcel of Cullinan Ranch is not yet breached and a full design process to create small islands and meandering channels is being carried out before it will be opened. 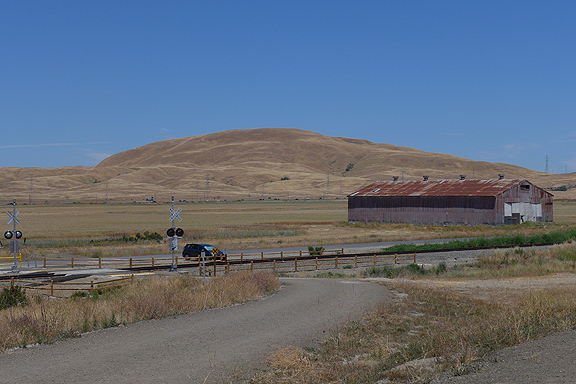 The eastern parcel is at left, not yet opened to the bay, and bay waters cover the larger Cullinan Ranch parcel on the other side of the levee. Both of these parcels lie north of Highway 37 and the restoration work has had to ensure that the road would remain above the waters and not suffer erosion from tides and wave action. 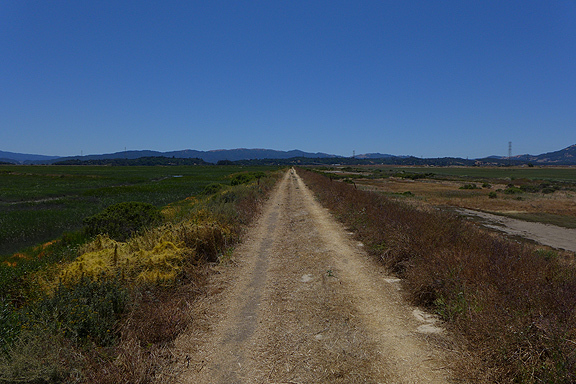 We wandered around the muddy beach and peered at the outrushing tide as it drained from the Cullinan Ranch “lake” back to Dutchman Slough on the way to the Napa River, then the Bay, and for some of those water molecules all the way back out the Golden Gate into the Pacific Ocean. There is something unexpectedly moving about closely observing a small part of a very large natural system, churning along in its twice daily rhythm to carve and scour and soak and drown shifting shores and sprawling wetlands. Simply beautiful! Dutchman Slough near the breach to Cullinan Ranch. 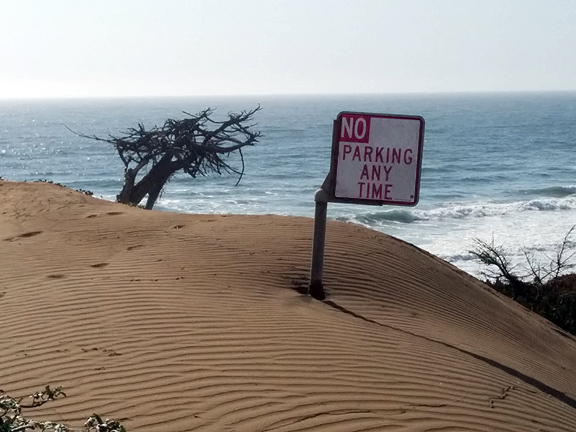 On an entirely unrelated walk a week earlier another example of assertive nature appeared before us as we walked from Fort Funston along the coast northward. Time for a managed retreat from the Pacific coast! No parking any time! June 25th, 2016 | Category: General Musings, Nature and Me, Technology? Thanks Chris. I love this, and you are right. 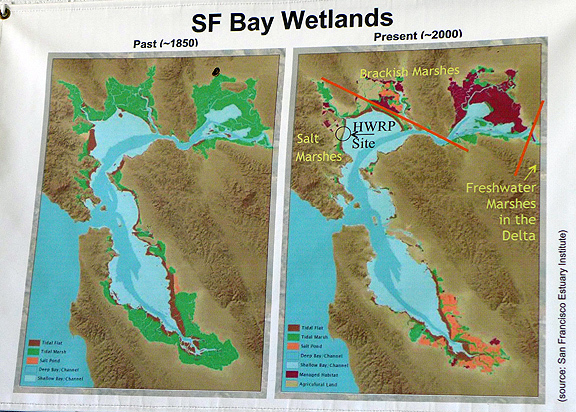 It’s terribly exciting to see these wetlands restored!